Do people still use real cameras? Except for the PhotoPass Cast Members, do people still use regular cameras at the parks or do they all just use their phones? Yes. I usually bring a DSLR. I always bring a proper camera. Phones just don't cut it if you want really good pictures. I always notice the Japanese tourists, usually young women, always have cameras at Disneyland. Cell phone use in Japan is not nearly as rampant as the USA, the Japanese government puts huge tariffs on Apple products because they aren't Japanese, and the Japanese people don't use the simpler cell phones they do have for cameras there either. I posted this photo a few days ago in the Marvel Land thread, but take a look at the two Japanese tourists walking by. Yup, she's got a Japanese camera hanging around her neck. I was in Japan recently and can tell you those big blousy trousers they are wearing are the height of Young Tokyo fashion too. Of course they still bring real cameras. If you want good photos in low light, a real camera is the only way to go. 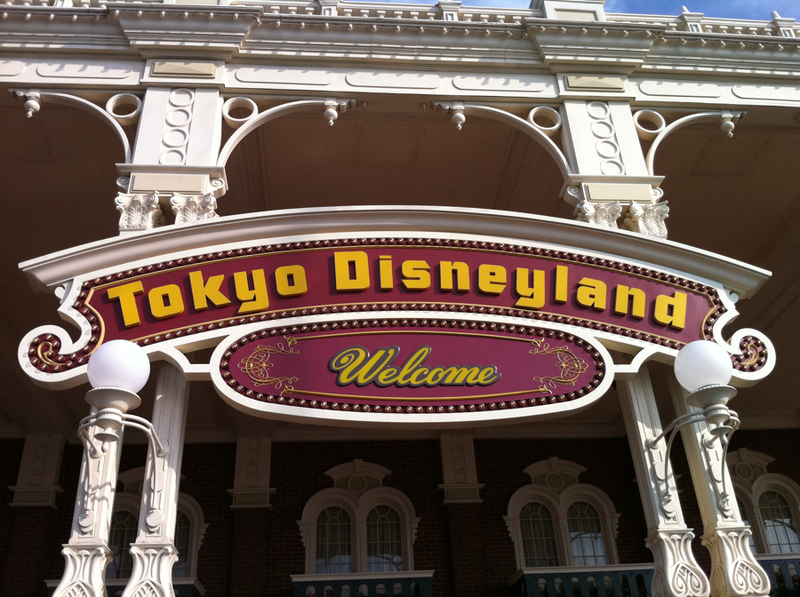 When I was a kid, I thought Japanese tourist took so many pictures of Disneyland so they could build their own. Depends on the trip. Sometimes I take my large DSLR cameras and other times I'm snapping with my phone. Although I do tend to wish I had my DSLR with me sometimes when taking photos with my phone. I'm just thinking just imagine how much more detail I would get out of it compared to my phone. Yes, i still use a real camera. I don't always bring it into the Parks with me however...usually only on days when i want to do a 'photography scavenger hunt' of things i specifically search out to take a snapshot of. I used my nice Canon film camera right up until a few years ago, when finding film and developing services became too challenging and expensive here. Five years ago i inherited a small digital camera that i started using on my adventures at Disneyland a few years ago, and still use it occasionally. More often however i tend to use my tablet for quick snapshots of various things of interest. It just makes it easier to immedaitely share here or elsewhere online, removing the 'scan' and 'upload elsewhere' work. How come, then, it seems like more people would use phones? Why would more people use phones ? There is no doubt, that for most people taking family snapshots on a vacation, the smartphone has taken the place of the point and shoot camera they used to carry along with them. That's why you see 5,000 smart phones go up in the air with the first note of Happily Ever After. It's convenient and way easier to share immediately with family and friends and the cameras in today's smartphones are absolutely amazing. There is also a second much smaller community who are amateur or hobbyist photographers who love the challenge of photography at disney parks. Whether it's the challenge of dark rides, or getting that perfect fireworks shot, there is virtually no type of photography that cannot be practiced within the bounds of Disney parks. Many of these folks (again, it's a small number) aren't necessarily on a family visit but are there solely to advance their photography hobby either alone or with fellow photographers with the same interests. These are the folks hauling the backpack full of camera gear and the tripod lining up way before the start of HEA to be sure their preferred location. Both approaches are totally valid for the individual making the choice. I'm one who will commonly haul the backpack full of high-end camera gear but sometimes I just don't feel like it arrive in the park with my iPhone and it works great when I need it. I just know on those days I'm not getting any dark ride shots or even considering trying to photograph a fireworks show like HEA or IllumiNations. I use my phone. For standard “people pics” it suffices. Try to take anything any distance away, and you realize how bad the picture quality is. The naked eye can see so much more than my iPhone 7. That said, I’m not carrying another item, so it will have to do! Yes, the most common photo being taken is surely from a cellphone camera. Sometimes you want a higher quality photo though. Usually when personally travelling or at events like weddings, etc. If I was a Disneyland AP I surely wouldn't have a DSLR with me most times. But as a tourist? Yes. A DSLR is a secondary high-brow purchase in today's age. If you have a reasonable phone, a second expensive dedicated camera is a difficult value proposition for some. It still takes better pictures, even if phones are rapidly bridging the gap. I stopped bringing my Sony because the employees at Disney and Universal kept getting confused by how to work it. I got my camera out the other day, and my grandkids asked" What's that?" Smart alec kids . I just got an ipod touch and it takes great pictures. I admit that I took over 500 pictures with it last time at WDW. I also take my regular camera and use it too. I still bring a p&s just for the zoom. I take my DSLR with my when I travel. My Disneyland pics turned out great, and I get some awesome AK shots at WDW. But when I was in DL and I had my camera out, at least once a day, I got asked to take someone's picture with their phone. What, do they think because I carry a camera that I know how to take a picture? Phone cameras are better than point and shoot cameras so why spend more for similar quality photos? DSLR cameras are always more expensive and unnecessary. Hard to bring on rides. Mid range cameras are not much cheaper. You’re talking $400. Photography is about the opportunity to take pictures. My smartphone is always a click away, charged and ready. My camera is properly packed away and never available. Maybe they think you are an honest person that won't steal their phone?